Morin-Heights, who maintains a cross-country and snowshoe trail network of 130 linear kilometres, of which 65 km is track set, is a member of the Réseau de ski de fond des Laurentides. 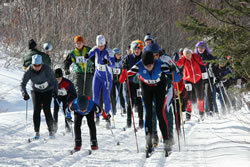 Click here for Cross-Country Ski conditions. Click here for the 2018-2019 fees. The Cross-Country Ski and Snowshoe Trails Map is also on sale for $3 at our different service centres. Track set trails are maintained by two snowmobiles and are limited by terrain and snow conditions. It takes a minimum of 16 machine-hours to reset the network in ideal conditions. This can increase dramatically due to snow depth, type and frequency of storms. The extensive 65 km of backcountry trails are cleared in autumn but are ungroomed during winter. Two-way traffic is permitted on backcountry trails; however, skiers should plan their route accordingly if it includes a section of track set trail with a recommended direction of travel. or inform someone of their itinerary and expected time of return. Morin-Heights does have a search & rescue team, but the size and ruggedness of the network make search and evacuation difficult in the best of conditions. Cell phones do not work in many areas. Snowshoers are invited to try out the 18 km of snowshoe trails maintained by the Municipality of Morin-Heights as well as an additional 12 km of trails at Sommet Morin Heights. Dogs and walkers are forbidden on ski trails. However, dogs are allowed on snowshoe trails providing they are on a leash (also to protect them) except between 10:00 and 15:00 on weekends and during holidays (Christmas ans school break). Their owners must clean up after them. Please read the document below regarding trapping on public land. Several incidents, some of which were serious, have resulted from encounters between skiers and dogs. Additionally, imprints left in the snow by dogs, walkers and snowshoers make it very difficult to ski. Gliding and wax adhesion are affected by damaged snow surfaces, resulting in aggravating slippage and added track-setting costs. Proper ski and poling tracks are vital for skiers and a large portion of trail fees are contributed specifically to grooming. Open every day from 8:30 to 17:00 (by mid-December). Services offered: Ticket office, information, a ventilated waxing room, parking, washroom and showers. Exit 60 of Highway 15 North. Take Route 364 W., towards Morin-Heights for 8 km. When you are at 1st set of traffic lights in Morin-Heights, turn left onto chemin du Village, left at the first stop on chemin du Lac-Écho and left again on rue Bellevue. Tickets and season’s passes, maps, information, a waxing table and parking. Exit 60 of Highway 15 North. Take Route 364 W., towards Morin-Heights for 8 km. When you are at 1st set of traffic lights in Morin-Heights, turn left onto chemin du Village and left at the first stop on chemin du Lac-Écho. Snowshoe network. Snowshoe, Ticket office, Snack-bar, Camping & Cabins. Cross-country and Telemark ski rentals. Private club; parking for members only. Free parking is available at the designated centres indicated on the map. Parking By-law 430 states that it is prohibited to park on streets and roads at all times between December 1st and April 15th. Offenders will be fined accordingly. All skiers and snowshoers must purchase and display a valid day ticket or season’s pass to use the networks. Revenues from tickets and or passes are used to maintain and develop the trail network. Tickets and passes are on sale through all access points. Patrollers are on the trails to provide assistance and check tickets and passes. Agreements with neighbouring networks permit ski trail access to the Viking and Sommet Morin Heights networks, but skiers must park in one of the Morin-Heights designated parking areas. Tickets may be purchased at all participating centres. Purchase your passes at the Chalet Bellevue. For the current fee structure consult the image below. Call 9-1-1, in case of an emergency. Dogs are forbidden on cross-country ski trails. Cross-country ski trails are for cross-country skiing only (snowshoeing, walking, and snowmobiles, etc. are forbidden). Visibly display a valid trail ticket or pass. Ski in the recommended direction for your safety and respect the signage. Never leave alone, and plan to be off the trail one hour before sunset. Check trail difficulty and conditions and plan accordingly. Do not litter, damage trees or fences, and do not make a fire. Morin-Heights has different types of accommodations to offer. Consult the Directory for a detailed listing. Listen to a radio interview on our municipal network.